I love God and I love basketball. While the duration of the basketball season is restricted, the term and the time to love God is unbridled and unabridged. 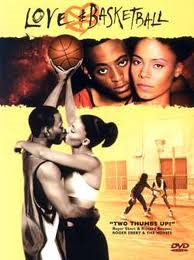 In the very respectable year 2000 Film Love and Basketball, the starlet and “Cinderella” Monica (Sanaa Lathan), moves in next door to her “Prince”, Quincy (Omar Epps). This is a spin on the ‘ole boy-meets-the-girl next door plot with a basketball twist. They’re 11, and both want to play in the NBA, just like Quincy’s dad. Their love-hate relationship lasts into high school, with Monica’s edge and Quincy’s top-dog attitude separating them, except when Quincy’s parents argue and he climbs through Monica’s window to sleep on the floor. As high school ends, love begins and they come together as a couple, but within a year, with both of them playing ball at USC, Quincy’s relationship with his father takes an ugly turn, and it leads to a break up with Monica. Some years later, their pro careers at a crossroads, they meet again, and it’s time for a final game of one-on-one with high stakes; love is on the line. In the end, love overcomes hate and basketball pays the freight. If you love basketball you should love God. There are so many similarities between God and basketball that time would fail me to list them all. But here are a few. God and basketball are unfathomable and inexhaustible, yet motive and moving. The game and God are attractive, alluring and appealing. God and basketball are like the wind; stirring, thrilling and exhilarating. Basketball and God are rousing, exciting and inviting. Our relationship with God and the game of basketball can be a fox trot or a slow drag; either way, both dances are loving and romantic. Love, like Basketball, is unpredictable and unpretentious; up in Heaven but also down to earth; always keeping you on your toes while smelling as good as a rose. Some basketball plays are so pretty they are worth more oohs and ahhs than you can count. Some behind-the- back passes and alley-oop dunks are so breathtaking that all you can do in response is to scream. And so it is with our Lord. God is full of love. In fact, God is Love. It’s His nature and his structure. He loves us so we in turn just ought to love Him. “We love him, because he first loved us” (1 John 4:19). He looked beyond our fault and saw our need. And we needed and yet need to be loved. We are sinners in need of a savior. And so God loved us and saved us from our sins. “Therefore I tell you, her sins, which are many, are forgiven, for she loved much; but he who is forgiven little, loves little” (Luke 7:47-48). So, it’s almost March. That means that it’s almost time for March Madness. March is the season, above all seasons, to love basketball. So join in with me and sing this new song: ‘Tis the season to love College Basketball. ‘Tis the season for bracket busters and buzzer beaters. ‘Tis the season for Cinderellas to be found in castle towers, for mice to turn into horses and for pumpkins to turn into chariots. What sports fan doesn’t love this time of year? Love controls us. It dictates that we watch endless hours of “March Madness;” this means watching game after game of teams with butterflies and night after night of games we never would pay to see otherwise. And so it is with our love for God. “For the love of Christ controls us, because we are convinced that one has died for all; therefore all have died (2 Corinthians 5:14-15, RSV). It’s the time of year to love basketball, and, even more so, it’s time to love God.